The Limited Edition Luccia 1.5 Carat Princess Cut Cubic Zirconia Criss Cross Trellis Solitaire Engagement Ring features a 7mm radiant cut princess cut in a stunning setting. This princess cut engagement ring style is beautifully designed with elegant flowing lines in a trellis or criss cross prong setting. The beautiful aesthetic of this ring makes for an amazing engagement ring and can be beautifully paired with any anniversary band or eternity band for a gorgeous wedding bridal set. Limited in 14k yellow gold and please see the pull down menu for available finger sizes. 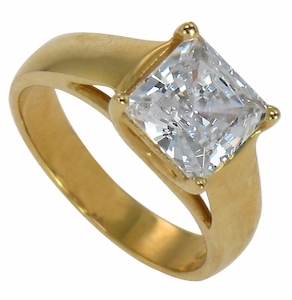 This solitaire is set the finest lab created original Russian formula, diamond quality, cubic zirconia that is hand cut and hand polished to exact diamond specifications. For further assistance, please contact us directly at 1-866-942-6663 or visit us via live chat and speak with a knowledgeable representative.